This walk: 2014-3-12. Dunnabridge, Pound, Judges Chair, Postman's Road, Brimpts North Mine, Loughtor Man, Laughter Tor, sheep measure, slotted gate posts, cow jaw, Cherrybrook Leat. Looking down the road towards Dunnabridge which is over a stream that shortly joins the West Dart River just 300 metres away on the right, in this view. Dunnabridge = bridge on the Down. View of Dunnabridge Pound Farm. Entrance to Dunnabridge Pound - built on a Bronze Age enclosure, used for impounding livestock found pastured illegally on the moor. The animals could be released on payment of a fine, otherwise they forfeited to teh Duchy. The Judge's Chair, said to have been moved from the Stannary Parliament at Crockern Tor: it would have taken a lot of effort? View of the interior of the Pound, an area of 2¼ acres (1 acre being 70 x 70 yards). Someone talking to The Plume of Feathers, being asked if he was friend of "Keith, the Brandy Man" !! "I don't think we'll take it". The arrangement of the stones is described by J. Butler (1991), Atlas of Dartmoor Antiquities II, The North. 28.12 Laughter Tor stone rows and cairns cairns, pages 58-59. Laughter Tor. Click the image to see a larger version. Gathered at the Listening Post? The Sheep Measure - a solitary stone enclosure that apparently when filled with sheep, gave a known numbers and avoided the need to count them - a soporific job? The stone posts are possibly part of a dolmen, taken with another stone lying outside the structure. An aside: Lanyon Quoit, near Heamoor, Penzance offers a view through the stones to Ding Dong Mine - both being places of our youth! Closer view of the hole, nothing to see ?! Slots in the other post. View of the avenue tor arrangement on Laughter tor. resulting from the erosion of softer rock between two harder outcrops. Do not know about this. A section of the Cherrybrook Leat to Brimpt's Mine. 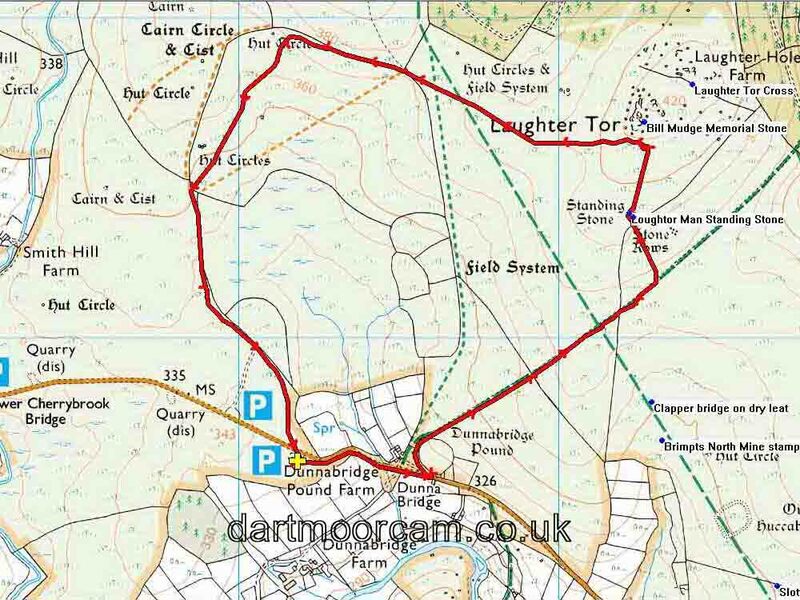 This walk was reached by driving east from Two Bridges to near Dunnabridge Pound, parking at the P and yellow cross symbols on the map. Distance - 5.0 km / 3.6 miles.